An exceptional table in Burr Amboina featuring Ruhlmann's aeroplane wing table top. The base is a full-fledged homage to architecture with it's arched support, egg-shaped cylinders resting on plinths. 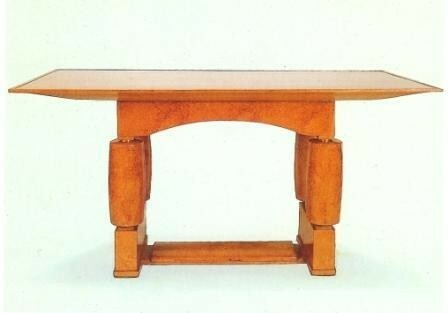 The table achieves it's lightness with the inclusion of gilt bronze rings that separate the sections of the uprights.